The Quest for Height: Grow Taller | Increase Height | Bone Size: Grow Taller with the Fibrous Capsule? 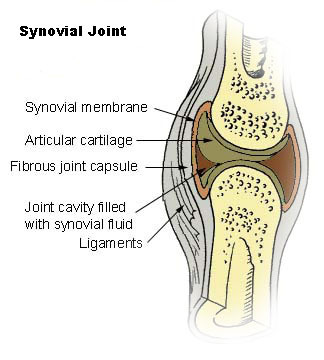 Another potential pardigm shift in regards to lateral synovial joint loading. The fibrous capsule is an extension of the periosteum from the bones. We already know how important the periosteum and periosteal progenitor cells are in limb lengthening surgery. The mechanism into which bone width is increased or the height of non-long bones is increased is by the periosteum. If you look at a diagram of the synovial joint. The fibrous capsule heads almost directly into the hyaline cartilage growth plate line. The space between the two sectors of bubbles on the epiphysis of the bone(the trabeculae) is where the hyaline cartilage growth plate line is. It's not visible on the diagram but it's visible on the x-ray. Joint Loading has the ability to increase interstitial fluid flow to provide shear strain on this fibrous capsule(the periosteum). The articular cartilage loading increases growth factors encouraging the periosteal progenitor cells to differentiate into cartilage cells and undergo endochondral ossification. While the shear in the periosteum damages the periosteum and releases the periosteal progenitor cells into the hyaline cartilage growth plate line. This could still work in conjunction with epiphyseal microfracture. Same method(LSJL), another possible hypothesis. "Mechanical impacts potentially induce tissue swelling and occasionally degradation of connective tissues in synovium and articular cartilage. These detrimental outcomes should be properly evaluated clinically and biochemically. Using two synovial cell cultures derived from normal and rheumatic tissues, we examined the biochemical effects of impulsive mechanical loads on expression and activities of influential proteolytic enzymes in joints, matrix metalloproteinases (MMPs), and their natural inhibitors, tissue inhibitors of metalloproteinases (TIMPs). The molecular analysis demonstrates that an impact factor (Im), the ratio of the maximum force to weight, served as a good indicator for assessment of the inflammatory responses. High impact above Im = 40 to 80 elevated not only expression but also enzymatic activities of MMPs[so possibly catabolic enzymes but remember MMPs can also form new cartilage canals which are the basis of growth plates]"
"A thin layer of synovial membrane in a joint is subjected to varying mechanical stress during running and cutting maneuvers including shear stress and impulsive shock"<-LSJL involves more shear stress than impulsive shock. "In both normal synovial cells, an increase in the mRNA level of MMP-1, MMP-2, and MMP-13 [occurred] in response to impulsive shocks"<-MMP-2 and 13 seem to be important in normal growth plates. MMP-1 seems to be a bad MMP. MMP-1 also doesn't increase from normal mechanical loading. "The shock with Im = 20 was effective to increase the mRNA level of TIMP-3 alone. The shocks with Im = 40 and 80 elevated the mRNA level of all TIMPs. "<-It's unclear which TIMPs are beneficial. "Collagenase activities, which would initiate degradation of intact collagen fibers, were significantly affected by impact factors. "<-Now the degrading of Type I collagen could be a good thing if it allows room for new growth plates to form. This study was in vitro so we don't know exactly the global effects on the entire system. It could have potentially formed new growth plates. i am going to out LSJL with a 35 lbs kettlebell which has a flat surface...btw, tyler do u load the whole joint or just the epiphysis of the tibia? TCD could you take a picture with a dash or mark of ink on the spot where we're supposed to load the weight at?